We’re proud to be developing aircraft that set new standards for comfort, performance and value. During the past twenty-five years, Spectrum has invested heavily in creating new and unique technologies that allow us to build exceptionally rugged aircraft that are up to 40% lighter than aluminum airplanes of similar size, resulting in substantially lower fuel consumption – and dramatically increased efficiency. 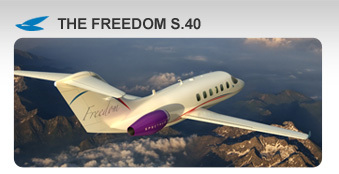 Spectrum’s Freedom S.40 mid-size jet offers stand up cabin accommodations for as many as nine passengers with cruising speeds up 440kts (MO.77) and a maximum range of more than 2200nm. 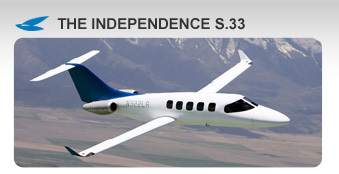 The Independence S.33 has the highest thrust to weight ratio of any business jet, operates safely from 2500-foot runways and offers a maximum non-stop range of 2000nm – all while cutting fuel costs in half.